The VC PMI artificial intelligence is telling us that the market has a bearish sentiment, but the moving average is bullish so it is a bit of a neutral signal. If the market comes down to 2789 to 2765, it is a very strong buying opportunity harmonically, with the daily, weekly, and monthly signals aligned at the B1/B2 levels. Mean-reversion trading seeks to capitalize on extreme changes in the price of a particular security or commodity, based on the assumption that it will revert to its previous state. The VC PMI is contrarian, so it advises buying when others are selling, and selling when others are buying. In the E-mini S&P, we are looking for a continuation of what appears to be a bearish trend momentum that is building up in the daily and weekly signals. 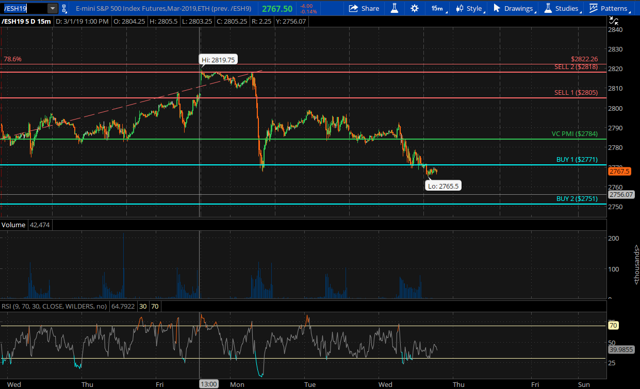 2760 is the ideal target for position or swing traders to the downside. The market has activated the first target of 2760, which is the mean or average price on a monthly basis. 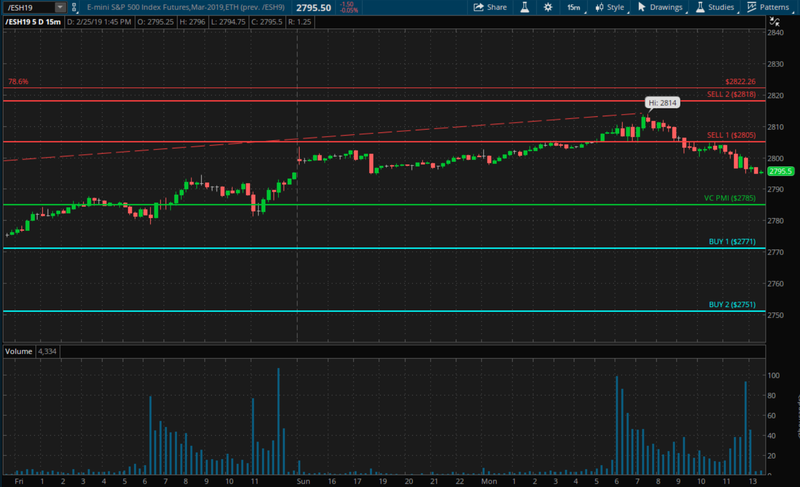 If we close below 2760, it will activate the targets of 2706 to 2627. Since our March 1 report we published on Seeking Alpha, the E-mini S&P has reached and activated the sell 1 (S1) level that we published of 2839. This was the first target on the monthly basis that identifies for you the extreme level above the mean on the monthly average price of 2760. After three decades as a trader, Patrick MontesDeOca founded The Equity Management Academy with the belief that “regular” investors could learn to trade like “Pros” when given the right tools. Patrick and Director of Research Dr. Scot Macdonald’s accrued knowledge is embodied in the fully automated proprietary trading program, Variable Changing Price Momentum Indicator (VC PMI). They offer subscribers to their SA Marketplace service, Mean Reversion Trading, regular reports and trading alerts on the S&P 500 E-mini, gold and silver. Patrick discusses his unique approach to trading during the in-depth conversation that follows. After 30 years working as a trader in New York and Chicago, Patrick MontesDeOca founded The Equity Management Academy out of a deeply held belief in the power of education to change investors’ financial outcomes. The Academy’s objective is to help all levels of traders from beginners to veterans become more effective at transforming knowledge into wealth. The centerpiece of the Academy is embodied in the fully automated proprietary trading program: the Variable Changing Price Momentum Indicator (VC PMI). The Academy also assists institutional traders and hedgers. Patrick and his team at The Equity Management Academy joined Seeking Alpha as contributors in 2017. Their Seeking Alpha reports are based on the VC PMI analysis of various markets including S&P 500 (SPXS) (SPXL) E-mini futures, Gold (GDXJ), Silver (USLV) and Bitcoin. They are written by Scot Macdonald, PhD, who is the Director of Research for the Equity Management Academy. E-Mini S&P 500: New Lows At 2627 Next? We are looking at the potential for the E-mini, once it closes below 2760, which is the monthly mean, to come down as low as 2706 to 2627. The weekly B2 level is 2759 and we are expecting overnight or over the next day or so that level to be met. The monthly B2 level is 2627, which has been activated as a potential target if the market closes below 2760. This is the Variable Changing Price Momentum Indicator (VC PMI) weekly update for March 6, 2019. On February 26, I wrote an article for Seeking Alpha titled, “The E-mini S&P 500: It is a Bull Trap!” When that report was published the E-mini S&P was at 2791. At that time, we indicated that if the market rallied up to the levels of 2805 to 2815, to take profits. We clearly stated in the report, “Look to take some profits on longs as we reach the 2805 to 2815 levels” (sell 1 and sell 2 levels of the VC PMI), which are the highest probabilities for the reversion to occur back down to the mean. The sell 1 (S1) level has a 90% probability of a reversion to the mean based on a 1:1 factor. The sell 2 (S2) level has a 95% probability of a reversion to the mean with a relative implied volatility factor of 2:1. E-Mini 500 S&P: It Is A Bull Trap! The ES has a bullish trend momentum because the price closed Friday above the 9-day moving average price of 2,658. With the market closing above 2,784 on Friday, we also came in with a weekly price momentum that was bullish. The daily, weekly, and monthly trends have aligned themselves for a reversion to the mean target of 2,785; the second target for the monthly mean is 2,618.